Cindy Snowden entered Christian Science nursing at Wide Horizon on January 1, 1990, receiving training there and at Tenacre. Once training was complete, she and her family with four children moved to St. Louis, Missouri. Over the next several years, she traveled to multiple facilities and private duty cases. 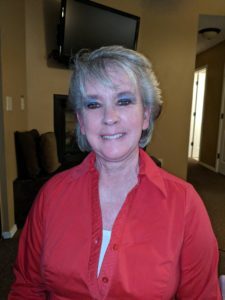 Cindy, with the support of her family, successfully opened a home for complete Christian Science nursing care, called Pilgrims Quest Inc., which she operated for 10 years. Afterward, she was led to become the Director of Christian Science Nursing at Broadview Inc. in Los Angeles for 5 1/2 years. Currently, she is serving in this capacity at Desert View, Christian Science Care in Scottsdale Arizona, where she has served since 2011. Cindy and her husband are avid cyclists, riding at least 100 miles a week when she is off-duty. Their combined family of 7 children and 11 grandchildren live all over the world which makes traveling fun and exciting!